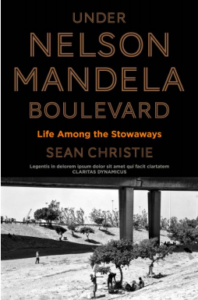 Part memoir, part ethnography, part friendship chronicle, Under Nelson Mandela Boulevard is Sean Hunter Christie’s account of his time spent amongst the Tanzanian stowaways who live rough under the Nelson Mandela Boulevard flyover, at the foot of Cape Town. The young Zimbabwean author is looking after the apartment of JM Coetzee, the Nobel laureate, recently emigrated to Australia, when a chance meeting with a serial stowaway, Adam Bashili, changes his life immeasurably. Adam introduces Sean to the extraordinary world of the ‘beachboys’, a multi-port, fourth-generation subculture of young men from the slums of Dar es Salaam, come to South Africa with the aim of stowing away on ships bound for other continents. As he writes in his journal after one of Adam’s many disappearances. By leading the author on an unprecedented tour of Dar es Salaam’s underworld, followed by a madcap heroin run down Africa’s east coast, Adam leads the author to a trail-head of his own: a way beyond his largely self-imposed oppression’s.